As a passionate fan of the genre, I can say that there just aren’t enough games, films, books and so on written in the noir genre. The glory days, back when Raymond Chandler was captivating audiences with his writing and Humphrey Bogart and Lauren Bacall were steaming up the silver screen, are long gone. Crime fiction has moved on and taken on different thematic traits, as society has also moved on and what noir once stood for has less of a social impact. Much like gothic horror literature was eventually replaced, so too has the noir genre. Related reading: Matt's review of the original The Silver Case on PlayStation 4. But, occasionally, a modern artist will feel a desire to take a crack at the unique tone of this period of crime fiction history. Goichi Suda is one. He did a remarkable job of that with his original The Silver Case – an old game now that was remastered for the new generations not long ago. That remaster evidently proved to be a success, so here we are sitting with a remaster of the sequel as well. Before we get into the review itself, it’s worth noting that this sequel, The 25th Ward: The Silver Case, has an interesting history in itself. Originally this game was released exclusively on flip phones in Japan; we’re talking about the standard phones that Japanese people used before smart phones were a thing. It was released in an episodic format, and on services that no longer exist. So, in effect, this remaster is also an archive; not only giving people in the west a chance to play the game for the very first time, but also preserving a game that was otherwise almost certain to disappear. Thankfully, it’s also a brilliant piece of noir fiction in its own right. Feverishly close to delirious at times, but brilliant all the same. Noir is an interesting genre. When most people think of it, they naturally jump to the iconic venetian blinds visual; with those contrasting black-and-white lines from light shining through the titular blinds, and falling on the face of the “hero” standing inside, giving him a sinister appearance. It's an appropriate visual, given that the genre is one of conflicted morality, and where the “heroes” are often quite sinister - they’re often private investigators or the like with one foot firmly in the underground. 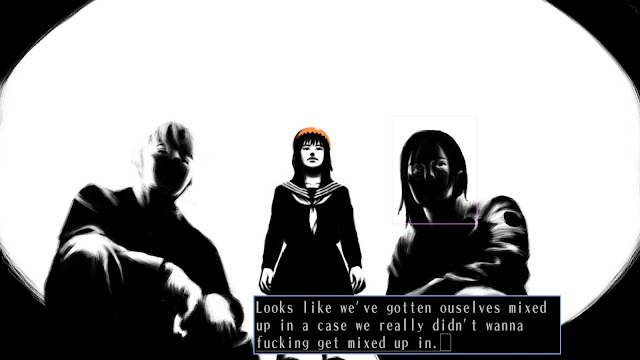 The Silver Case does a brilliant job of recreating that. Visually, it’s noir 101, being incredibly heavy on the use of very high contrast colours (and, often, black and white, just like the very best in noir). 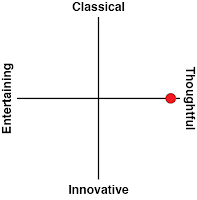 Thematically, it is a game of dense moral conflict. Just to give you one tiny sample from a web of narrative strands that had me constantly wondering what kind of Sade-like mind could possibly come up with this stuff; in one scene the protagonist heads off to a mortician to get a key, which is needed to unlock a lock (funny that). For absolutely no reason whatsoever, the mortician digresses into a conversation about how much he likes snuff films. It was delivered in such a deadpan manner that I thought it was some kind of joke, but no, in what I could only describe as a surreal five minutes or so, I got an in-depth explanation of what it’s like to be a snuff film connoisseur, and the culture of fans around the hobby. Delivered in such deadpan tone by a mortician, covered in blood, as though he were talking about his pressed flower collection, I genuinely struggled to comprehend what the hell was going on. And that was just a random side conversation. The game's main plot is no less surreal. 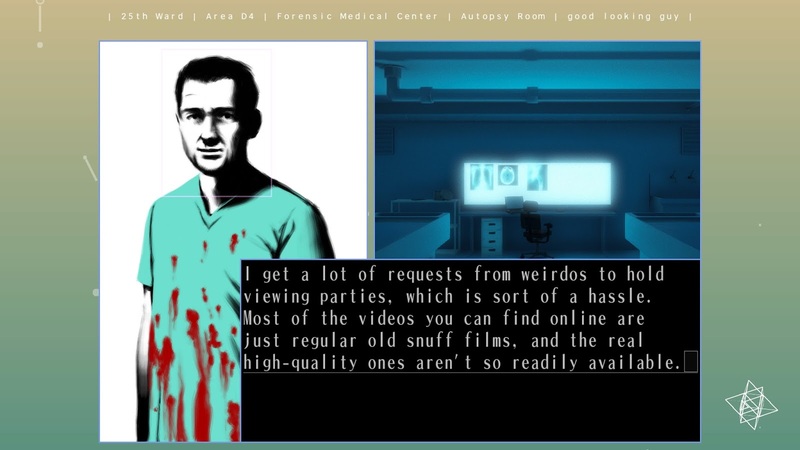 Morally conflicted people – heroes, let alone villains – are very much the name of The Silver Case. And it’s surreal. So very, very surreal. It verges on the Dada at times. Over and over again events go on lengthy digressions or take a turn for the weird for no seeming reason. Events happen out of context of the main plot. 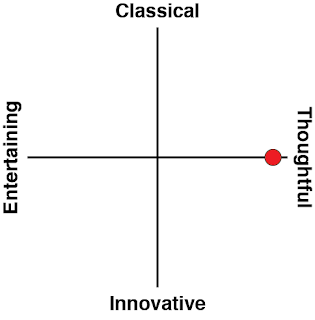 The narrative jumps in time and location with no sense of linearity or reason. Often it’s funny. Often it’s darkly funny. Often it’s just plain bleak. The transitions between those moments of humour and horror are not clearly defined. 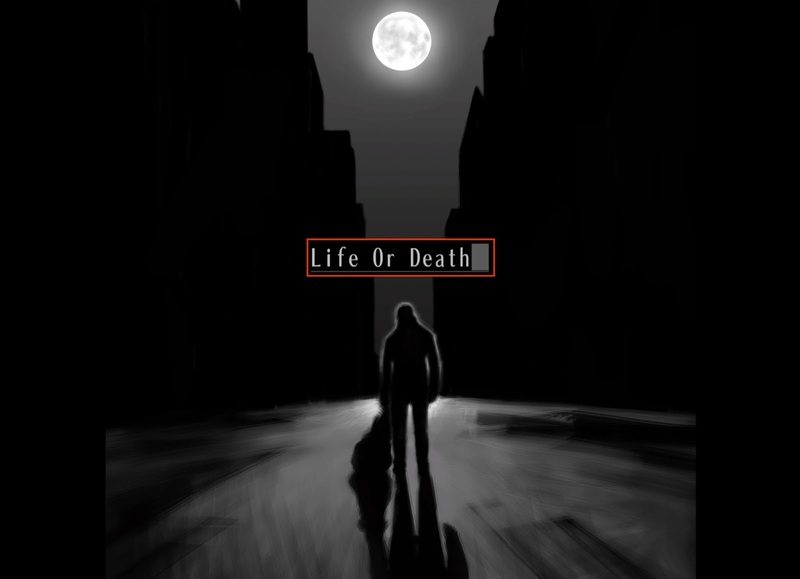 But this game’s narrative is always weird, always barely restrained, and really difficult to follow. 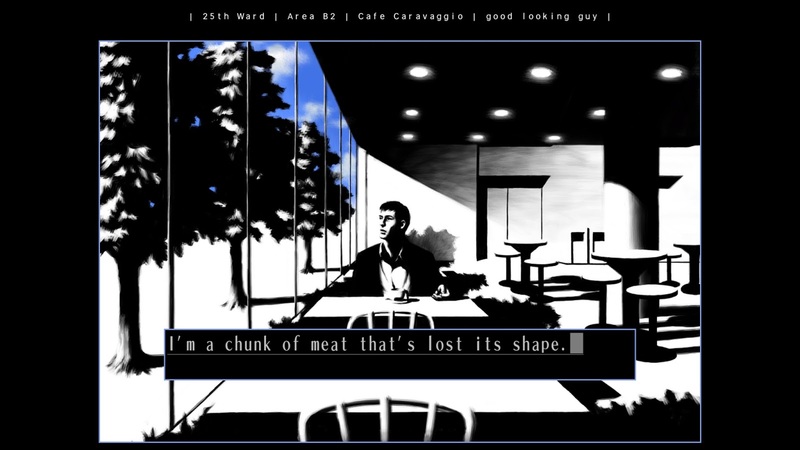 The original The Silver Case was dense itself, and certainly had that same sense of Artaudian narrative pacing and a willingness to break with narrative form. It wasn’t a game you wanted to play after a few beers because it became too difficult to follow. But stone cold sober 25th Ward is hard enough. And, significantly, there’s no way to go back and check on something that was set earlier in the scene without replaying an entire chapter. Most visual novels, keep a log of previous comments, but with this one I found I had to take screenshots to keep referencing back as I played. And if any game needed to give you the ability to jump back for a refresher on previous bits of storytelling, it is this one. For its density, 25th Ward really does tell a great story, and eventually it becomes clear that a lot of the complexity is necessary to give the game its edgy tone, sharp wit, an darker themes. The noir genre in general is both complex and rich; I remember when, back when I was at school, I had to watch The Big Sleep and Blade Runner a few dozen times each to really start to pull them apart and dig deep into their themes, so I actually don’t have an issue with 25th Ward being like this. I only say all of this to warn players less comfortable with dense storytelling to not go in expecting a easy time of it. People are going to dislike the gameplay bits, though. Goichi Suda enjoys sending people on hunts for needles in haystacks, and having to comb entire apartment blocks for a critical clue to push the narrative forward is going to aggravate some players. It doesn’t help that the interface is cumbersome as sin, too. Down in the corner of the screen, replacing a conventional menu for selecting actions like “Look”, “Talk” and “Move”, is a dice, which you need to manually spin around to arrive at the action that you need to take. This means that every time you want to talk to a character or move to a different location, your ability to do so is slowed right down by the need to manipulate this dice system. There’s no way to describe this as anything other than “cumbersome” and “clunky.” But, at the risk of marching myself up a hill to perish on, I’m going to say that I liked it. Thematically, the UI elements fit with the edgy noir tone of the rest of the game perfectly. A streamlined, conventional UI simply wouldn’t have had the same impact, and, given that the “gameplay” bits are few and far between (this is a visual novel, after all), I’m happy to make the tradeoff to have a more tonally consistent game. Heck, given the game is borderline Dadaist in the way it seems to want to confuse and confound you, a streamlined interface would have been just too easy to deal with. To say that The 25th Ward is niche would be an understatement, but that’s what’s so impressive about it. It respects the intelligence of its players, allowing them to wade through the feverish surrealism that the game often depicts, and melds that perfectly with a traditional noir thriller than Raymond Chandler himself would have been proud of. Goichi Suda might be known for his action games today (and they’re usually very fine games in their own right), but what I wouldn’t give for him to go back for another spin or two at the visual novel.